Our New England winter has been a bit more brutal than usual and the snow fall has been significant. 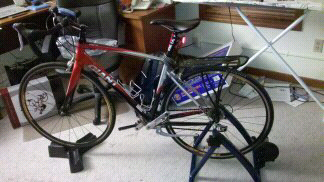 That, and my recent lack of interest in running, has led me to get a trainer--a bike trainer. I've really been enjoying using the trainer in the morning before I go to work. I can catch up on the news (or more likely SportsCenter) while I get a good workout and work up a good sweat. I have found only two problems with the trainer. Up until now, I've used my Garmin watch to track my runs/rides. But, while I'm indoors, that won't work, so I'll need to get something new. Second, I've been smelling burning rubber. I've adjusted the tension a bit which has cut down on the smell, but it hasn't completely gone away. Apparently that's a side effect of the trainers. Either way, I'm happy to have a warm place to workout while I wait for New England to thaw.